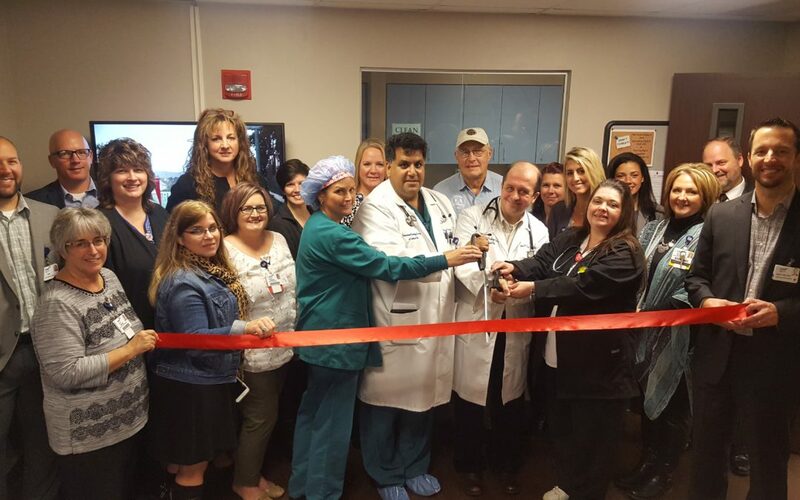 The Wilmington-Clinton County Chamber of Commerce and CMH Regional Health System welcomed Drs. Nihad Al-Assaad and Rakesh Chawla to the new Cardiology Associates of Southwest Ohio practice on Friday, November 3rd. Cardiology Associates of Southwest Ohio is located in Suite 105 in the CMH Professional Building, 610 West Main Street, Wilmington. Nihad Al-Assaad, MD, FACC has joined CMH as part of Cardiology Associates of Southwest Ohio and has been named Medical Director of Interventional Cardiology. Dr. Al-Assaad received his Doctor of Medicine degree from the University of Aleppo in Aleppo, Syria. He completed a residency in Internal Medicine at Case Western Reserve University, MetroHealth Medical Center, in Cleveland, Ohio, a fellowship in Vascular Medicine and a fellowship in Cardiology at Lahey Clinic Medical Center in Burlington, Massachusetts, and an Interventional Cardiology Fellowship at University of Cincinnati. Dr. Al-Assaad has over fifteen years of experience as a Cardiologist, and seven years experience in interventions, working in Canton, Elyria, and most recently with Genesis HealthCare in Zanesville. He is a Fellow of the American College of Cardiology, the Society of Cardiovascular Angiography and Interventions, the American Society of Nuclear Cardiology, the Society of Vascular Medicine and Biology, and the American College of Physicians; and is board certified in Internal Medicine, Cardiovascular Disease, and Interventional Cardiology by the American Board of Internal Medicine. Dr. Rakesh Chawla: Rakesh Chawla, MD, FACC, FSCAI, FACP has also joined CMH as part of Cardiology Associates of Southwest Ohio. Dr. Chawla received his Doctor of Medicine degree from Jefferson Medical College of Thomas Jefferson University in Philadelphia. He completed a residency in Internal Medicine with Summa Health System, a fellowship in Cardiovascular Medicine at Medical College of Wisconsin Affiliated Hospitals, and an Interventional Cardiology Fellowship at University of California, San Francisco. Dr. Chawla has over thirteen years of experience as an Interventional Cardiologist, working in Chillicothe, Columbus, Cleveland, and most recently with St. Joseph Medical Group in Fort Wayne, Indiana. While at Adena Regional Medical Center in Chillicothe, Dr. Chawla led a team of registered nurses, pharmacists, and radiation technologists in acute myocardial infarction angioplasty without surgical backup, a CPORT Registry which was approved by the state of Ohio in collaboration with the Johns Hopkins School of Medicine and its lead investigator, Thomas Aversanno, MD, FACC. It was the only such hospital/organization to perform emergency cardiac angioplasty without surgical backup in Ohio at the time. He is a Fellow of the American College of Cardiology, the Society of Cardiovascular Angiography and Interventions, and the American College of Physicians; and is licensed in Cardiovascular Disease and Interventional Cardiology by the American Board of Internal Medicine.